Background:Maternal mortality is on the rise in Nigeria with the North- East having the highest ratio, and Borno state records one of the highest maternal mortality ratios in the country. Objective:To determine the trends in maternal mortality in UMTH, identify the background socio- cultural factors, establish the major causes of deaths and determine avoidable factors. Study design:Retrospective study of maternal deaths. Methods: The case records of all recorded cases of maternal deaths between January 2001 and December 2005 inclusive were retrieved and relevant data obtained and analysed. Results: The maternal mortality ratio (MMR) for the period under review was 430 per 100,000 live births. There were annual fluctuations in MMR. However, there was a consistently rising trend in MMR from 2002-2004 with the highest ratio of 545 per 100,000 live births recorded in the year 2004, with a decline in 2005. Thirty (78.9%) of these deaths occurred among the unbooked patients and more than 90% of this were referred as obstetric emergencies. Age range was 14-39 years with a mean of 26.5years. The highest maternal death occurred at the two extremes of reproductive age group (14-19 years and 35 years and above). Grandmultiparas suffered the highest maternal mortality of 36.8%, followed by teenage mothers. P1-4 contributed the least to maternal mortality. The direct causes of maternal death accounted for 92.1% of the deaths. The major causes of death were eclampsia 34.2%, sepsis 26.3% and prolonged obstructed labour/ruptured uterus 13.2%. Amongst the indirect causes of maternal death, HIV/Tuberculosis was the leading cause accounting for 5.3%. Basic but professional antenatal care, skilled attendance at birth, community mobilization and health education messages for a healthy pregnancy and safe birth will help to reduce the unacceptably high maternal mortality ratio in Borno state and the country at large. Maternal mortality is the death of a woman who is pregnant or who has been pregnant within the preceding six weeks, irrespective of the duration or site of the pregnancy from any cause related to or aggravated by pregnancy or its management, but not from accidental or incidental causes  . It is a public health problem in Nigeria due to the unacceptable high ratio and to the fact that in a large percentage of cases, the deaths are preventable  . Over 600,000 women die annually from complications during pregnancy, childbirth, or postpartum period. Nearly all of these deaths occur in developing countries, where fertility rates are higher and a woman's life time risk of dying during pregnancy and child birth is over 400 times higher than in developed countries , . With a maternal mortality ratio of 1,500 per 100,000 live births and some 55,000 maternal deaths annually, Nigeria presently is 2% of the world's population, but accounts for 10% of the world's maternal deaths  . Nigeria ranks second globally (next to India) in number of maternal deaths  . The recent National Demographic and Health Survey (NDHS) data suggests that the ratios are different in the six geopolitical zones of the country  . A population-based study indicated that maternal mortality ratio is worst in northern Nigeria; an average staggering figure of 2,420 (ranging between 1,373 and 4,477) per 100,000 live births was recorded in Kano state  , north western Nigeria. The north­eastern region which includes Borno state has an estimated maternal mortality ratio of 1,549 per 100,000 live births  , and 1,732 per 100,000 live births reported from Bauchi state  in the same north eastern region. These ratios are the worst in the world. In a series from Jos, Plateau state, north-central Nigeria, a maternal mortality ratio of 740 per 100,000 live births was reported  . A ratio of 1700 per 100,000 live births was reported from Lagos  , and that of Sagamu  was 1,930 per 100,000 live births, all in south-western Nigeria. Globally, the regional MMR is highest in Africa (830), followed by Asia (330), Oceania (240), Latin America and the Caribbean (190), and the developed countries (20)  . The issue of maternal mortality has been neglected for a long time especially in developing countries like ours, and this negligence is not unconnected with the low status of women in these countries. Although teaching hospital statistics do not present national maternal mortality ratios, they are usually more accurate and can usefully be compared with ratios in similar institutions in developed countries. Data obtained can be used for developing policies for reducing maternal mortality ratios by increasing the quality of prenatal and obstetric care and for determining trends over a period of time. The magnitude of maternal mortality will therefore be more appreciated if there are periodic reviews of the various causes. In this review these causes of maternal deaths are discussed and preventive measures suggested. This was a hospital based retrospective study that was carried out to document our experiences with maternal mortality with the view of finding the trend over a five year period in UMTH, Maiduguri, Borno State. The study population included patients who delivered at UMTH and those who had miscarriages or were transferred after delivery elsewhere. Data were identified by reviewing all maternal deaths that occurred in UMTH from January 2001 to December 2005, and those whose folders could not be traced, were excluded from the analysis. The retrieval rate of the case records was 88.3% (38 case records). Cases were identified through labour ward, obstetric theatre, obstetric ward, ICU and accident and emergency records. The case notes were retrieved from the central records library. Data collected included the booking status, age, gravidity, parity, educational status, area of residence, ethnic group, the date and time from hospital admission until death, clinical management of the patient, causes of death, and circumstances surrounding the deaths as recorded in the patient's folder. Causes of mortality were conditions classified in chapter 15 of the tenth revision of International Statistical Classification of Diseases and Related Health Problems (ICD-10)  . When there was more than one possible cause of death, priority was given to the primary obstetric cause judged on the basis of available clinical information, assessment and diagnosis. The ICD-10 also recognizes that some women die as a consequence of direct or indirect causes after 42 days and has introduced a category for late maternal deaths defined as those deaths occurring between 42 days and one year after abortion, miscarriage, or delivery that are due to direct or indirect maternal causes  . We could not get data regarding maternal deaths, 42 days and one year after abortion, miscarriage, or delivery that are due to direct or indirect maternal causes in our study as this was a hospital based retrospective study. We also assessed whether the maternal deaths might have been prevented. Since assessment of preventability is difficult  , we attempted to identify any substandard care that appeared to us to contribute to maternal death, as defined in the Report on Confidential Enquiries into Maternal Deaths in England and Wales 1997-1999  . Findings were recorded on a pre-formed format sheet designed for the study and data were coded and transferred into an IBM compatible PC and analyzed using SPSS statistical package version 9. Frequency and descriptive statistics were computed. The maternal mortality ratio was calculated by dividing maternal death counts by the total number of live births recorded within the same period multiplied by 100,000. To determine the trend in maternal mortality ratios over the study period, a linear regression model that fitted the data by considering MMR as a continuous variable that depend on time (years) was plotted. The results were presented by simple statistical tables. The study was approved by the local research and ethical committee of the hospital. [Table 1] shows yearly variation of maternal mortality ratio (MMR). A total of 43 maternal deaths occurred among 9,992 live births over the 5-year period, making the maternal mortality ratio (MMR) 430 per 100,000 live births. There were annual fluctuations in MMR. However, there was a consistently rising trend in MMR from 2002-2004 with the highest ratio of 545 per 100,000 live births recorded in the year 2004. The trend is graphically illustrated in [Figure 1]. There is a strong positive correlation of MMR over the study period. The linear regression model gave a very good fit as portrayed by the coefficient of determination R 2 = -2.04. The association between maternal socio-demographic characteristics and maternal deaths from pregnancy and its complications is displayed in [Table 2]. The mean age of women who died during pregnancy and childbirth was 26.5 (range 14-39years). The majority of mothers who died were aged <19 years and 35 & more (26.3% and 28.9%, respectively). Also most of them were of para zero and para 5 or more (34.2% and 36.8%, respectively). Thus, the greatest risk of maternal death was among early teenagers and older women. Another correlate of maternal death was the educational level of the women. In this study, about 39.5% of maternal deaths occurred in women who were non-literate. Furthermore, the higher a woman's educational level, the less likely that she would die as a result of pregnancy complications. The ethnic group of the women was also an important risk factor for maternal mortality. The women who died during pregnancy and childbirth in UMTH during the study period were from 8 ethnic groups. Although the Kanuri/Shuwa is one of the major indigenous and dominant ethnic groups, and accounted for 20.8% of all live births during the study period, they contributed a disproportionate 50.0% to maternal deaths, while Yoruba and Igbo contributed the least to maternal deaths with 5.2% each. These data show that the Kanuri/Shuwa ethnic group was at a higher risk of dying as a result of pregnancy and its associated complications in UMTH. Place of residence may have been a strong predictor of maternal deaths in this study, though the distance in Kilometres were not recorded in the case notes, majority (68.2%) as inferred from case records were from rural areas and beyond 20km radius from UMTH. 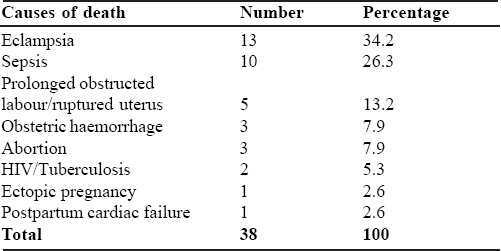 The direct and indirect causes of maternal deaths are shown in [Table 3]. The direct obstetric causes of maternal deaths accounted for 92.1%. The major causes of death were eclampsia 34.2%, sepsis 26.3% and prolonged obstructed labour/ruptured uterus 13.2%. Others were abortion and obstetric haemorrhage accounting for 7.9% each, while ectopic pregnancy accounted for fewer numbers of maternal deaths (2.6%). Amongst the indirect causes of maternal death, HIV/Tuberculosis was the leading cause accounting for 5.3% while postpartum cardiac failure accounted for 2.6% of the maternal deaths. The death of a woman of reproductive age group is not only a tragedy to her family but to the nation as a whole. This study revealed that maternal mortality ratio (MMR) is still high in UMTH as was similarly reported in earlier studies ,,,, within the same geopoloical zone. This finding is much lower than in other parts of the country ,,, but higher than MMR reported  in the same hospital a decade ago. This might, among others, be as a result of increase in referrals, pooling of high risk cases, epileptic health care services occasioned by industrial actions by health workers. However this finding is unacceptably high when compared to the developed countries , . There were annual fluctuations in MMR during the study period. However, there was a consistently rising trend in MMR from 2002-2004 with the highest ratio of 545 per 100,000 live births recorded in the year 2004, most probably due to increasing referrals and or infection but subsequently started to decline rapidly in 2005 most probably due to improved emergency obstetric care and utilization of health facilities. The 'crescendo-descendo' pattern of maternal mortality ratios recorded in this study indicated that maternal mortality in Nigeria could exhibit 'episodic outbreaks' and could be a 'dynamic process' probably associated with certain trigger factors  . Inconsistent and ever changing health policies and increasing cost of health care may have contributed significantly to the fluctuating maternal mortality ratios found in this study. Similar findings have been recorded in Kano  , Bauchi  and Jos  . In consonance with other studies ,,,, , maternal mortality is highest at the two extremes of life. This may be the result of teenage pregnancy and its associated complications. This study also revealed that the older women (35 years and above) are most vulnerable. This may be due to the fact that they tended to be grandmultipara and also age related medical disorders might have set in. It has also been observed that maternal mortality is higher in those of low parity especially primigravidas and the unbooked in this review. The highest number of deaths occurred among Kanuri/Shuwa ethnic group followed by Babur-Bura and Hausa/Fulani. A particularly striking finding in this study was the high risk of the Kanuri/Shuwa ethnic group for maternal mortality. Of the 8 ethnic groups, the Kanuri/Shuwa ethnic group alone was responsible for 50.0% of deaths. The women in this ethnic group were mostly non-literate and unbooked. Although this may reflect the demographic pattern in the community, some socio- cultural factors may be involved. Illiteracy was found to be closely associated with maternal mortality ratio, as 39.5% of all maternal deaths in this study occurred in women who had no formal education. Others have shown that a large proportion of women dying in Nigeria are young illiterate women of low socio-economic status ,,,, . The leading cause of death in this report was eclampsia (34.2%), as similarly reported by previous studies ,,,, within the same geopolitical zone and other series , , across the country. In Jos  , north-central Nigeria, Sagamu  , south-western Nigeria, and Enugu  , south-eastern Nigeria; obstetric haemorrhage and illegal abortions were the leading causes of maternal deaths. The fact that eclampsia is the leading cause of death in most of these reports, is a strong evidence that it constitutes a constant threat to pregnant mothers in these zones, and therefore, deserves to be considered priority target for intervention. These deaths are preventable if appropriate antenatal care was available to these patients. Puerperal sepsis was the second leading cause of death in this study being responsible for 26.3%, as similarly reported from Jos  , north-central Nigeria. This was because of undue delay in presentation. Most of these patients came in with overwhelming infection having delivered at home following a prolonged labour and delivery. Similar findings were reported within the same zone ,,, . The role of TBAs who conduct the vast majority of our midwifery services cannot be under estimated  . It is desirable that this category of health workers be educated on the need for asepsis in their practises. Obstructed labour as a cause of death is virtually unknown in the developed world in present day obstetrics. It sadly continues to claim many lives in developing countries. In this study, it was the third leading cause of death and accounted for 13.2%. This may be as a result of more pregnancies at advanced ages in this study. Similar observations ,, , were made in this environment. The contribution of induced abortion to maternal mortality in UMTH was 7.9% which is comparable to 9.6% reported from Jos  north-central Nigeria. While unsafe abortion and its related complications was the leading cause of maternal deaths in some series , from southern part of the country, it is the 4 th leading cause of maternal deaths in this series. The high incidence of maternal mortality due to unsafe abortion reported in this study provides ominous and warning signals to the magnitude of reproductive morbidity and mortality in Nigerian women, particularly among adolescents in northern Nigeria. Obstetric haemorrohage, whether antepartum or postpartum, is the fastest killer among all major causes of maternal deaths, causing death within hours rather than days. It accounted for 7.9% in this review. Five point two percent (5.2%) was due to PPH. This finding agrees with other reports that showed PPH as being a commoner cause of death than APH , . This however, contrasts with a report from Bauchi  within the same geopolitical zone, where ante-partum haemorrhage nearly equals postpartum haemorrhage. Ectopic pregnancy was responsible for 2.6% of maternal deaths in this series as compared to 3.8% in a series reported from Bauchi State  . HIV encephalopathy and disseminated tuberculosis ranked highest among the indirect causes of maternal death in UMTH (5.2%). This is comparable to 7.3% from a previous study in the same locality  . Postpartum cardiac failure, accounted for 2.60% in this series. This patient died before treatment could be offered to her. In conclusion maternal mortality ratio (MMR) in UMTH, Nigeria has remained high, though there were annual fluctuations in MMR, the trend is rising. In order to reduce this ratio to the barest minimum, good quality and accessible antenatal care services must be encouraged. Other measures should include universal formal education, educating the people on the causes of maternal mortality and morbidity and the training of TBAs that provide 80% of the maternity care services in our region to screen for and refer high-risk patients early in pregnancy. 1. World Health Organization (WHO), International Statistical Classification of Diseases and Related Health Problems (ICD), tenth revision, Geneva, 1992; 123-128. 2. Chukwudebelu W. O. Preventing maternal Mortality in developing countries. In Contemporary Obstetrics and Gynaecology for developing countries. 1 st edition, edited by Okonofua F and Odunsi K. Women's Health and Action Research Centre (Benin City) 2003; Pp644-657. 4. United Nations (UN), world health organization (WHO) and World Bank partner to combat maternal mortality. The World Bank group news release no.2000/080/S. 5. Adamu Y. M., Salihu H. M., Sathiakumar N., Alexander G. R. Maternal mortality in northern Nigeria: a population-based study. Eur. J. Obstet. Gynaecol. Reprod. Biol. 2003; 109: 153- 159. 6. Gilda S., Henshaw S., Susheela S. et al. Induced abortion: Estimated rates and trends worldwide. Lancet. 2007; 370 (9595): 1338-1345. 7. National Demographic and Health Survey, National Population Commission, Abuja, Nigeria; 2004 edition. 8. Yusuf M. A. Pattern of maternal morbidity and mortality in Kano State: A geographical analysis. J Soc Mgt Science. 9 (special edition) 2005, 196-221. 9. National Population Commission (Nigeria), 2004. 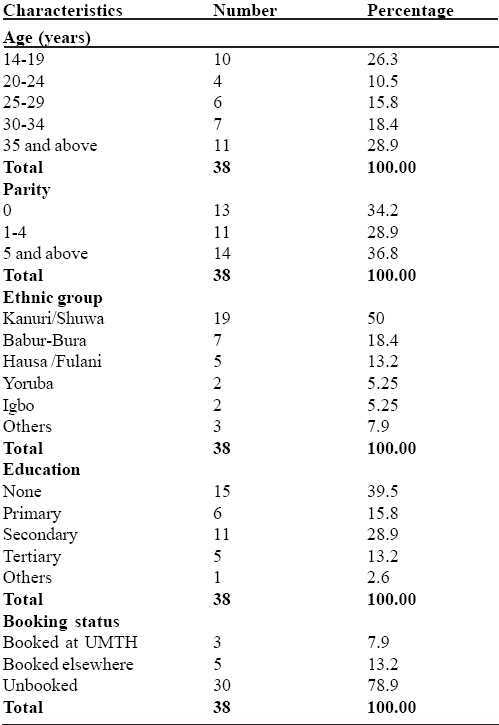 Nigeria Demographic and Health Survey 2003. MD: National Population Commission and ORC/Macro, p 51-60. 10. Mairiga A. G. and Saleh W. Maternal Mortality at the State Specialist Hospital Bauchi, northern Nigeria. East African Medical Journal. 2009; 86(1): 25-30. 11. Ujah L. A. O., Aisien O. A., Mutihir J. T., Vander jag D. J., Glew R. H. and Uguru V. E. Factors contributing to maternal mortality in Jos, north-central Nigeria: A seventeen-year review. Afr J Reprod Health 2005, 9(3): 27-40. 12. Agboghoroma O. C. and Emuveyan E. E. Maternal Mortality in Lagos, Nigeria: a ten-year review (1986-1995). Nig Quart J Hosp Med. 1997; 7: 230-233. 13. Olatunji A. O. and Sule-Odu. Maternal Mortality at Sagamu, Nigeria. A ten-year review (1988-1997); The Nig. Postgr. Med. J. 2001; 8(1): 12-18. 14. Lale S. Mie I. Samuel M and Emi S. Mortality in 2005: estimates developed by WHO, UNICEF, UNFPA and the World Bank. Geneva: WHO; 2007; 15-17. 15. UNFPA. 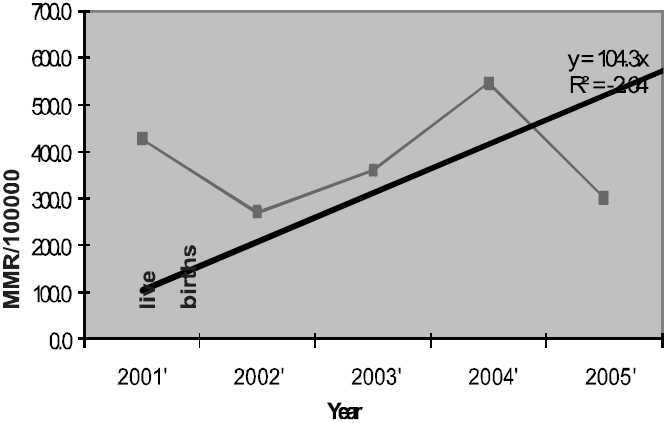 Reproductive Health and Gender indicators: Baseline Survey of UNFPA assisted states in Nigeria, 2004. UNFPA 2005. 16. Schuitemaker N. W., Gravenhorst J. B., VanGeijn H. P., Dekker G. A. Maternal Mortality and its prevention. Eur. J. Obstet. Gynaecol. Reprod. Biol. 1991; 42: 31-35. 17. Lewis G. Report on confidential enquiries into maternal deaths in England and Wales, 1997-1999. London: RCOG Press, 2001: 190-194. 18. Bobzom D. N., Mai A. M., Chama C. M. and Muna D. M. Maternal Mortality in Maiduguri, Nigeria. Journal of Obstetrics and Gynaecology 1998; 18 (2): 139-140. 19. Chama C. Status of Emergency Obstetric services in six states of Nigeria (Borno state). A need assessment report: Society of Gynaecology and Obstetrics of Nigeria 2004; Pp8-15. 20. El-Nafaty A. U. Annual Report on Maternal Mortality project in Borno State. Submitted to the John D And Catherine T Mac Arthur Foundation. 1997. 21. Chama C. M., Audu B. M. and Mairiga A. G. The status of reproductive health facilities in Borno State. Borno Medical Journal, 2006; 3(1): 12-16. 22. Fathalla M. F. Imagine a world where mother hood is safe for all women-you can help make it happen. (The Hubert de Watteville Memorial Lecture). International Journal of Gynaecology and Obstetrics 2001; 72: 207-213. 23. Khalid S. K., Daniel W., Lale S. et al. WHO analysis of causes of maternal death: a systematic review. Lancet. 2006; 367 (9516): 1066-1074. 24. Okoro J. M., Umezulike A. C., Onah H. E., Chukwuali L. I., Ezugwu O. F., Nweke P. C. Maternal Mortality at the University of Nigeria Teaching Hospital, Enugu, before and after Kenya. Afr J Reprod Health. 2001; 5: 90-97. 25. Mela G. S., EL-Nafaty A. U., Massa A. A. and Audu B. M. Obstructed labour: a public health problem in Gombe, Gombe State, Nigeria. J Obstet Gynaecol 2003; 23(4): 369-373.